* New topic: Oliver Sacks: "Night of the Ginkgo" in The New Yorker. * Added special page on Bonsai-page with dwarf (penjing) Ginkgo trees from China, photos by James Wilkins. Penjing, also known as penzai, is the ancient Chinese art of depicting artistically formed trees, other plants, and landscapes in miniature. 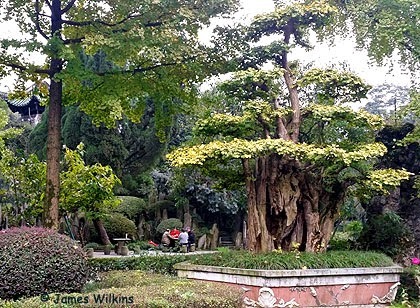 Location of this old Ginkgo tree: Qingxi Gardens, Sichuan, Chengdu, Dujiangyan city in China. More Bonsai photos on my Bonsai-page. Photo: James Wilkins, thank you! Mungwang-myeon reservoir, Goesan-gun, Chungcheongbuk-do, South Korea. 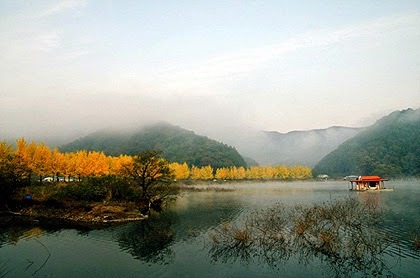 Many beautiful Ginkgo trees in fall, thick mist over the reservoir. Video by Jonghun Kim on YouTube. * Two new supersized photos on my Photospecial page: Buddha and two Ginkgo trees, Artis Zoo, Amsterdam. Video of Great Ginkgo (Oicho), height 33 m, girth 6.5 m, planted ca. 1620. Location: Kingenji Temple, Okuizumo City, Shimane Prefecture in Japan. The harmony between the “Kayabuki" (thatched roof) house and yellow leaves and the reflection of the leaves in the pond is stunning. Videos by Nimo5 on YouTube.